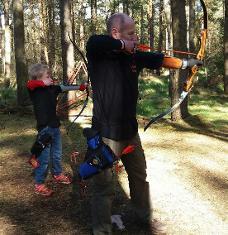 entitles you to use the **Members Facilities at Bowhunter Archery and provides compulsory insurance. We do, however, insist that the Bowhunter Archery Rules are followed and if you haven't attended an introductory course then we highly recommend that you do – not only will it provide you with more confidence and improve your shooting but it will also ensure you are safe and can keep others around you safe. From time-to-time we run a Fun Shoot for Members Only – this way you get to enjoy the whole woods and it is more social – the BBQ afterwards is normally a great time to chat with other archers and compare notes! (bring your own sausages though!) This event is free unless hiring equipment. In conjuncton with AIM (Archery In Moray), we also run regular competitions with other independant archery clubs throughout Moray/Grampian/Highland region. These competitions are not obligatory, however they are an enjoyable way to monitor your own personal development and skill improvement. Membership also entitles you to a discount of 10% off Friends & Family – as long as you are with them – book them in for a session and your group will benefit from 10% off – great chance to enjoy the Combat Archery! Talk to us for more information. *All Junior members must be accompanied by an adult (over 18) at ALL times. **Members Facilities INCLUDE : Short Range Practice, Long Range Practice, Unmarked Distance Field Animals, Marked Distance Field Animals, Mini Zone. Any 3D target is dependent on bow poundage and current usage. We are accessible in most areas to chair users and restricted mobility. Tea/Coffee/juices are available (donation box). What next? Contact us to arrange to come along and look around. Either phone 07923 111997 or 07753 426141. Email us or send us a facebook message, we will always confirm so if you haven't heard from us something has gone wrong – try contacting us again! We can sometimes handle last minute requests so phone or text. We are on hand to offer advice and can also help guide archers through the maze of purchasing their own equipment, so please do not hesitate to get in touch regarding any aspect of Bowhunter Archery Membership or if you just want to show us your new bow!